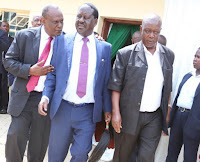 Thursday April 11, 2019-Former Jubilee Vice-Chairman, David Murathe, on Wednesday revealed how the handshake saved President Uhuru Kenyatta from Deputy President William Ruto and his allies. Speaking in an interview with Tony Gachoka in his political show Point Blank, Murathe, a close ally of Uhuru, disclosed that MPs allied to Ruto used to blackmail Uhuru in Parliament until Raila Odinga came with the handshake. According to Murathe, Ruto has been neutralized since the handshake and no longer holds a gun over Uhuru’s head. “In terms of Parliament, there was some alignment which was making it possible for the DP’s side to blackmail the President. Like if you don’t do this, we won’t pass this. It was like they were holding a gun to his head until Raila came,” Murathe stated. “So when Raila came in with his numbers, Kalonzo came in, Gideon was already in and Mudavadi also came in. It is no longer possible for them to hold a gun over a matter to be prosecuted in the House,” he commented.